Gov. 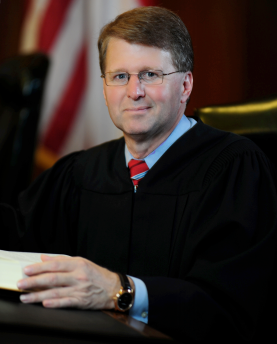 Pat McCrory has appointed a new chief justice to the North Carolina Supreme Court. The chief has influence over the highest court but also lower courts in the state. So what does this mean for the new chief Justice Mark Martin? He could play a role in a landmark voting law case or on death penalty appeals, says former Justice Robert Orr. "The chief has only one vote out of the seven, but obviously he has a leadership responsibility in the court's calendaring and the decision making process,” Orr says. But the chief’s responsibilities extend outside of the highest court. The chief has oversight of the North Carolina court system, which is an enormous part of state government. Orr says that in addition to writing opinions on cases, the chief has to deal with elected officials, the state bar, and citizens. "It's a big job,” Orr says. “And for that he gets a $3,000 pay raise." Martin is guaranteed the job only until the election in November. He and his opponent, Brunswick County Superior Court Judge Ola Lewis, are both Republicans. In naming Martin, McCrory followed a tradition of naming as chief the member with the most seniority on the bench. Martin has served for 20 years on the state's Court of Appeals and the Supreme Court. After a ceremony announcing his appointment on Monday, Martin said he wants to do a top-to-bottom review to see where costs can be trimmed, and that additional funding may be needed in some areas. “We need to make sure that the forensics that enter our court rooms are accurate and to make sure that when jurors come into the court room they can rely on the information that's presented,” he says. The chief justice's seat will be up for election in November. Martin's opponent, Brunswick County Superior Court Judge Ola Lewis, is also a Republican. Justice Paul Newby, the Republican incumbent running for the state Supreme Court, has released a new TV ad. He's running against Democratic Judge Sam Ervin. North Carolinians should hear more ads from Newby and Ervin as election day nears. Newby's campaign has released a new one this week. Campaign ad: "Meet Paul Newby, our Supreme Court Justice, Citizen Lawyer..."
Less than a decade ago, North Carolina instituted a public financing program for appellate judicial elections that was hailed as a nationwide model. But it’s being tested this year by the state Supreme Court race between incumbent Justice Paul Newby, and his challenger, Court of Appeals Judge Sam Ervin. Supporters of incumbent Justice Paul Newby hope this 30-second television ad will help people remember Newby’s name when they vote. Ad:" Paul Newby, he’s a tough old judge respected everywhere. Paul Newby- justice tough but fair."